Where the original martial art originated from no one really knows, but what is recorded is that about fourteen hundred years ago the founder of Zen Buddhism left India and traveled alone to China to present lectures on Buddhism. Daruma (Bodhidharma) eventually ended up at a Shao-lin Temple in Hunan Province lecturing on Buddhism. It's said that a great multitude of followers fell from exhaustion from the harshness of his training. Daruma set forth a method by which the priests were able to develop their strength both physical and spiritual so that they could finish their training. This method came to be called Shorin-Ji Kempo. This system eventually found it's way to the Ryu-kyu Islands and developed into Okinawa-te and this developed into Karate. About five hundred years ago a national policy came about under which possession of any and all weapons by the people of Okinawa were forbidden. Then about two hundred years later weapons on the Ryukyu Islands had been confiscated by the government when the islands came under the rule of the Satsuma Clan of Japan. Since the people weren't allowed traditional weapons with which to defend themselves they had to use improvised weapons made from common farm implements, refine the art of unarmed combat, and train in secret. Karate was not a sport were the loser went home. It was life or death with no time or room for hesitation or doubt. The movements had to be automatic, precise, and lethal or die trying. Kata is one of the training tools that the Karataka used to condition there sub concise for instant response to attacks. Kata contains in them stances, blocks, strikes and combinations of techniques that must be used with out the slightest hesitation in order to insure your survival. Mind and body must be one when you have a sword that can shatter wooden armor sweeping toward your neck, welded by a man trained from childhood in the arts of war. When one trains in secret one does not always have a training partner. You can't just get four or five friends together for a few hours to keep their reflexes sharp they use kata to maintain their combat skills, and to make their fighting smoother, and more fluid. In today's time kata serves all of these purpose and more. Kata helps us to maintain a sense of origins of our art. Kata helps us to focus our minds, and relieve stress. Kata strengthens our bodies and minds into a single unit able to accomplish more together than apart. This synergy is the secret that most non-karate practitioners can never hope to understand or defeat. Karate is more than a fighting style, more than an art, it's a way of life and kata allows us a chance to understand what the original masters of our art meant and were trying to convey to us their descedants. Here is a quick list of black belts and there instructors. 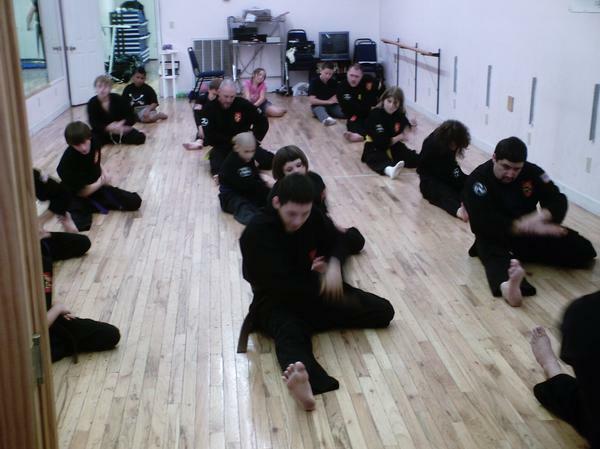 Kata- (Kah-tah)- A group of pre arranged movements or forms necessary to learn Okinawan martial arts. Kiai- (KEE-eye)- This is a shout from the pit of the stomach to protect your midsection, intimidate your opponent and control your breathing. In the opinion of most traditional artist kata is the key foundation to any martial arts. A kata is a group of prearrange punches blocks and strikes that can be anywhere from 10 days old to hundreds of years old. Most traditional martial artists (like Sensei McCoy or myself) prefer the older kata. Another name for kata is forms. The term forms are used in Korean martial arts more often then in Japanese / Okinawan martial arts.